VFD Archives - Allied Automation, Inc. Simple and safe operability, compact design as well as improved performance features were the focus during the development of the FR-D700 frequency inverter. A drive was created that set standards in the field of compact drives. Improved functions and device properties such as simplified cabling thanks to spring clamps, the integrated Digital Dial with LED display, improved performance yield in the low-speed range as well as the integrated emergency stop function make the FR-D700 the standard in the ultra compact class. The FR-D700 is especially advantageous for standard applications by virtue of its user- friendliness. It is the correct choice in both simple and more sophisticated applications. Typical applications are feeder and conveyor drives, machining tools or gate and door drives. 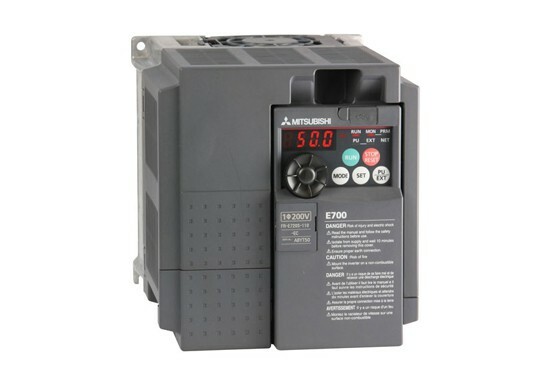 With 11 million frequency inverter drives already sold, Mitsubishi Electric now introduces its latest generation of compact inverters, the FR-E700 series. In addition to better features and performance than their predecessors, the models in the series are also more compact and even easier to install. Improvements include an integrated USB port, an integrated one-touch Digital Dial control with a display, improved power usage at low speeds and an expansion slot compatible with the many option cards from the 700 series. All this makes the FR-E700 an economical and highly-versatile solution for a wide range of applications from textiles machines to door and gate drive systems to material handling systems. Long lifetime – Frequency inverter drives from Mitsubishi Electric are famous for their reliability and longevity. The FR-E700 is designed for a service life of over 10 years. Among other things, this is made possible by high-performance heat-resistant capacitors, cooling fans with sealed bearings and special lubricating greases. The flows of cooling air only come into contact with the heat sinks, not with the electronic components, ensuring that no dust or dirt can collect on the components. The circuit boards are very well protected against aggressive environments with single or double coatings of varnish – another feature that ensures a longer service life. 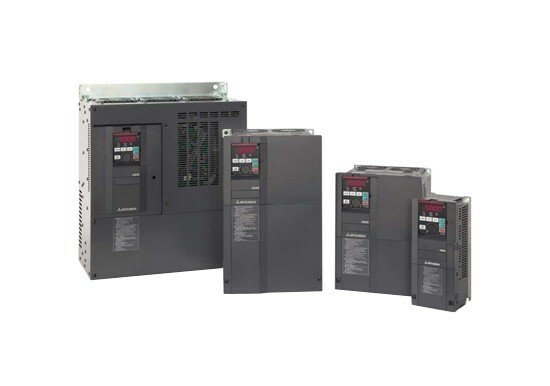 The F800 Series is a VFD range which has been optimized for maximum energy savings with pump and fan control. F800 is equally at home in an industrial environment or in the residential / commercial sector as part of an integrated HVAC solution. 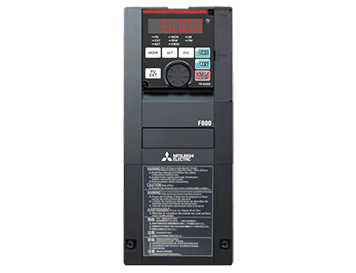 Designed for unparalleled drive precision, speed control, simple startup, and versatility, Mitsubishi Electric has developed a new generation of drive technology: the remarkable FR-A800. Some of the outstanding features are the integrated high level PLC, USB port for programming and parameter copying, an-easy to-read control panel, optimum power usage and energy saving functions, improved system safety, three expansion slots for a range of option and supported network card. The FR-A800 Series is fully backwards compatible with the FR-A700 series. Parameters can be easily copied by FR Configurator2. In order to match the former machine response time, the input/output signals of the FR-A800 can be delayed. The FR-A800 series has a two channel emergency stop for safe shutdown. This ensures safe operation without installation of another contractor. The operation panel with the one touch Digital Dial allows direct access to all important parameters. The FR-A800 series also allows the connection of a Mitsubishi Electric graphical operation terminal (GOT). Communication parameters for the HMI connection are automatically set as a batch. Take advantage of the energy saving function that suits your application. The impressive energy savings can be displayed on the energy monitor. The cooling fans and the built-in capacitors have an estimated lifespan of 10 years. By using the ON/OFF control function, the service life of the fans can be even further extended.